Canine Chondrocytes (CnC) are derived from normal canine articular cartilage where they produce and maintain the extracellular matrix of cartilage. Following monolayer culturing, CnC can be grown in alginate microspheres to study chondrocyte proliferation and metabolism in a three-dimensional in vitro system. Alginate microspheres provide more physiological conditions for the chondrocytes and allow them to sustain normal proteoglycans production and retention. Because of the prevalence of degenerative joint disease in geriatric dogs, CnC can be a useful tool for veterinary practice. Canine Chondrocytes (CnC) from Cell Applications, Inc. were utilized to evaluate anti-inflammatory and anti-oxidant activity of Glyco-Flex III and trans-pterostilbene. They were also used in material studies aimed to develop optimal surfaces/scaffolds for engineered tissues, cellular arrays, biosensors and lab-on-chip devices. Canine Chondrocytes: CnC. 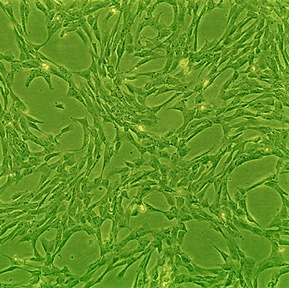 Cartilage producing cells isolated from dog joint tissue. Martinez, S., Y. Chen, E. Ho, S. Martinez, and N. Davies. 2015. Pharmacological effects of a C-phycocyanin-based multicomponent nutraceutical in an in-vitro canine chondrocyte model of osteoarthritis. Canadian J Vet Res, 79:241-249. Yamka, R. and N. Frantz. 2015. Compositions including pyruvate for companion animals and methods of use thereof. Patent US 8999375 B2. Shaik, J., J.S. Mohammed, M. McShane, and D. Mills. 2013a. In vitro evaluation of chondrosarcoma cells and canine chondrocytes on layer-by-layer (LbL) self-assembled multilayer nanofilms. Biofabrication. 5:015004. Shaik, J., J. Shaikh Mohammed, M.J. McShane, and D.K. Mills. 2013b. Chondrocyte Behavior on Micropatterns Fabricated Using Layer-by-Layer Lift-Off: Morphological Analysis. Journal of Medical Engineering. 2013. Yamka, R. and N. Frantz. 2010. Compositions including pyruvate for companion animals and methods of use thereof. Patent Application US 20120289598 A1. Remsberg, C.M., J.A. Yáñez, Y. Ohgami, K.R. Vega-Villa, A.M. Rimando, and N.M. Davies. 2008. Pharmacometrics of pterostilbene: preclinical pharmacokinetics and metabolism, anticancer, antiinflammatory, antioxidant and analgesic activity. Phytotherapy Research. 22:169-179. Yáñez, J.A., C.M. Remsberg, K.R. Vega-Villa, N.D. Miranda, J. Navas, Y. Ohgami, D. McCormick, K. Hughes, C. Temple, and S.A. Martinez. 2008. Pharmacological evaluation of Glyco-Flex® III and its constituents on canine chondrocytes. Journal of Medical Sciences. 8:1-14.